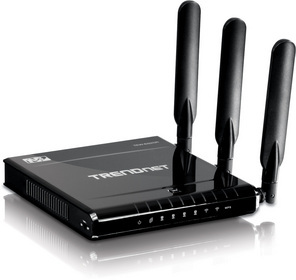 TORRANCE, CA--(Marketwire - January 4, 2011) - TRENDnet, a best-in-class wired and wireless networking hardware brand, today from CES demonstrates the first to market 450Mbps Concurrent Dual Band Wireless N Router, model TEW-692GR. Gigabit Ethernet ports maintains high performance wired connections. Wi-Fi Protected Setup (WPS) integrates other WPS supported wireless adapters at the touch of a button. Gone are the days of entering complicated encryption codes; simply press the WPS button on the TEW-690AP, and then press the WPS button on a compatible wireless adapter -- the devices automatically exchange information and connect. WMM technology further prioritized video and audio packets. "A true 450Mbps concurrent router will provide the networking enthusiast with another great option," stated Sonny Su, Technology Director for TRENDnet. "With the proliferation of so many wireless networked devices, performance matters more than ever before."